The buzz has been consistent—thunderingly consistent. Not since Kogi BBQ has there been such excitement about a West Coast quick-service concept. But this one feels bigger to me; more important, more universal, less trendy, and at the tip of the innovation triangle. Like the iPad of food, Southern California restaurant Lemonade is where all the developments of the last decade have come together to form one world-beater of a product. Maybe I am overstating it, but I don’t think I am. I love Lemonade and I think it is the future of food. Now that I have anointed it “the next big thing,” let’s take a step back to explain what it is. Lemonade was founded by chef Alan Jackson to “capture the L.A. spirit of adventure about food,” according to its website. The company bio goes on to state that Lemonade has “an appreciation of the freshest seasonal ingredients, and a desire to reinterpret familiar dishes with unexpected twists. The food is for people who care about what they eat. It’s clean, healthy, and inventive.” In layman’s terms, it is a modern take on a classic 1950s high-school cafeteria with fresh and simple food and drinks. It has 13 locations in Southern California and shows no signs of slowing down its expansion. The recipes and design have established something that is completely original and of the moment without being pretentious or trendy. So what makes it so great? Let me tell you. The Food. “Seasonal Southern California Comfort Food” is a genre that I have been trying to define for years. This moniker is not universal—some call it Modern American or Continental—and there are no rules beyond the food being delicious, fresh, and encompassing multiple ethnicities. More importantly, this cuisine is what people want in New York, London, San Francisco, Hong Kong, and wherever else young urbanites are using Instagram, shopping at Topshop, and downing cappuccinos. These groups have a yearning desire for food that is seasonal, market fresh, healthy, highly flavorful, tied to no distinct cultural group, and presented beautifully. The global youth movement wants everything to be healthy, fresh, tasty, aspirational, and responsible—in other words, it feels good, tastes good, looks good, is guilt free, and you can tell your friends about it. Lemonade has perfected the delivery vehicle for this desire. The Emotional Connection. To start, Lemonade has realized that a great hospitality experience has as much to do with how the business connects to its customers culturally as it does with what is being served. In the post-industrial age, having a great product is not enough; the emotional connection is paramount. This factor is a huge differentiator between a moderately successful regional company like Così and a cultural juggernaut like Starbucks. Lemonade has the potential to be like Starbucks because the brand and experience are as good as the product. Everyone can relate to the cafeteria because everyone went to school, and Lemonade has recreated it with better food, service, and seating, while maintaining the emotional essence. The Perceived Health. Yes, there are calories in the food and even cupcakes on the menu, but when you eat at Lemonade, you feel like you are being healthy. It hits on all of the touch points for perceived health: a beautiful environment, great branding, quality ingredients, freshness, and light preparations. The food is sourced from local farms, prepared on premise daily, and—bonus!—it tastes even better than it looks. The Price/Value Relationship. Food trends begin in upscale restaurants and then trickle down to national quick service. Before the early ’90s, nobody outside a Japanese restaurant sold a Spicy Tuna Roll, and it was expensive. Now you can get one for $4.95 at your local grocery store or add it to your meal at chains like Houston’s. Lemonade’s seasonal cuisine is similar. Up until a couple of years ago, these types of food were only available at high-end restaurants like Chez Panisse. Now you can enjoy them nightly on your way home from work for less than $15 per person. The price/value relationship is tremendous because it would take double or triple that to replicate this level of product at home with ingredients from a local grocer or green market. The Branding. Branding has always been a differentiator in the quick-service space, but today it is more important than ever. Dunkin’ Donuts coffee isn’t my favorite because it doesn’t feel like me. I would rather pay $1 extra to support a brand like Four Barrel because it feels more like me. I like to think of myself as a “Four Barrel guy,” not a “Dunkin’ guy.” I’m even more excited to be a “Lemonade guy.” The brand is young, hip, colorful, and crisp, with elements of retro Americana that make me feel right at home. All of the above is irrelevant unless the business model makes sense. 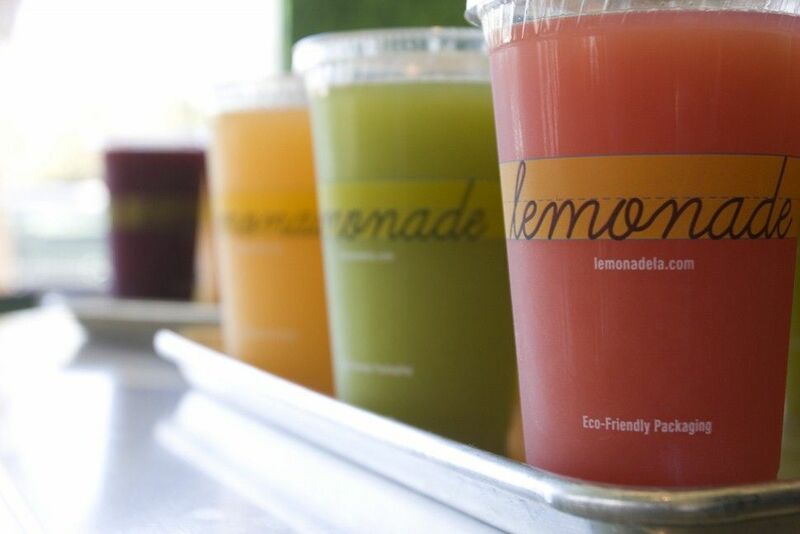 Lemonade supplies its stores from a commissary and finishes the food on site to maintain freshness and control costs. Combine this approach with the limited staffing needed for a fast-casual concept, and you have a model that is both scalable and profitable. As demand increases alongside efficiencies, Lemonade should be able to establish regional footprints and own its segment nationally. WHAT: Seasonal Southern California comfort food in a fast-casual cafeteria setting.